Create a beautiful home with high quality, energy efficient windows. Discover all the choices available and get inspired. Building a new home or replacing existing windows? With more than 50 years of experience, trust Milgard for a beautiful selection of styles, frames and materials that can brighten any home. Wondering how to choose the right window for your home? With so many options, it can be hard to decide between vinyl, fiberglass, wood or aluminum. Request a free, no-obligation consultation with a Milgard Certified Dealer who can answer your questions and help make the dream of new windows a reality. When quality matters, Milgard windows stand up while standing out. Browse our vast selection of custom made windows, in a variety of styles and colors to suit any home. Our top of the line vinyl window with premium features, an elegant style and exceptional performance. A contemporary vinyl window with the maximum available viewable glass area. A clean design and a quality vinyl window that is very affordable. Strong and beautiful, durable fiberglass windows are built to last. Light and thin with the hallmarks of aluminum durability. The triple pane provides exceptional sound control in the busiest environments. An innovative, high performance vinyl window designed specifically for Texas. We've created this handy comparison chart showing our product series selections. The way a window operates can provide a room with the right amount of light and air flow. Take time to envision how you want your window to open and what it can help you achieve throughout your home. Horizontal sliding windows are a common style that is very easy to use. The sash slides either to the left or right, depending on where you wish to direct the air flow in the room. If you are considering larger window sizes, sliders are a good option. For single hung windows, the bottom sash slides up and down to open and close the window. The top sash stays in place and allows light to enter the home, but not air flow. Because they open vertically, they save space when the house exterior faces a patio or walking path. With double hung windows, both the top and bottom sash operate. They offer the same space saving convenience of a single hung window. They have an added bonus of being easy to clean because the sashes tilt inward. This can be helpful if the window is on a second story. Casement windows have a hinge on one side and open outward by rotating a crank style handle. 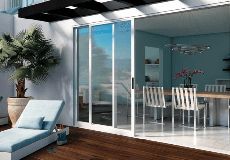 Because they open like a door, they allow the maximum amount of ventilation into the home where airflow is desired. They offer an unobstructed view, because there is no rail in the center. With an awning window, the sash is hinged at the top and swings upward. This allows air to flow into the home with side to side ventilation, while also helping to keep the rain out. This style of window tends to be smaller in size and is often wider than it is tall. Picture windows provide an unobstructed view to the outside for the maximum amount of daylight to flood your home. Picture windows are fixed and do not open making them ideal for rooms in need of natural lighting. From bay to bow, radius or garden windows. Specialty windows are just that, special. Whether you envision windows that protrude out from your home to add a stylistic touch, or, you like the softness a curve can bring, see all the specialty windows Milgard has to offer. A well-crafted frame can make all the difference in your window performance. Explore these options to determine which window frame material is best suited for your home and the region you live in. Wood is prized for its natural beauty and warmth. It can also be painted or stained to complement a home’s interior. It has natural insulating properties and works well in temperate climates. Vinyl frames are known for being energy efficient due to their ability to trap air. In addition to their insulating properties, vinyl frames are UV resistant, require little maintenance and are generally more affordable than other frame materials. Commonly used for retrofit. Fiberglass is an innovative option that resists swelling, rotting and warping. They are exceptionally strong, low-maintenance and ideal for any style of home or climate. This is a beautiful option that is long lasting and durable. Aluminum is a recognized and established frame material that residential architects and builders love. Light yet strong, aluminum windows can be configured into a wide variety of combinations. They are low maintenance and best for non-corrosive environments.